Dr. Michael Keramati is one of these types of personalities, with a career that is far reaching, diverse and extremely focused on the well-being of his patients and his colleagues. Dr. Keramati is unique in his profession in the sense that he is a dual-degree practitioner, being both a physician and a dental surgeon. He received his Bachelor of Science Degree (B.S.) from the University of Iowa, majoring in Microbiology and Chemistry, giving him a strong background not only in Microbiology, but Biochemistry as well. He continued to get his Doctor of Dental Surgery degree from the University of Iowa, followed by a three year residency and Fellowship in general and hospital dentistry at the University of Iowa Hospitals and Clinics. Additionally, he has taught at the College of Dentistry, which culminated in his being selected as the Teacher of the Year in 1989. After moving to California, he started a private practice while teaching at the University Of California, College of Dentistry. He later became Director of the Department of Oral Diagnosis and the Director for the Aids Educational Training Center for Dentist in Southern California. After 12 years of practicing dentistry, his focus expanded to include medicine, and Dr. Keramati attended medical school at the Western University of Health Sciences in Pomona, California. After getting his D.O. degree, he entered a Family Practice Residency program at White Memorial Hospital in Los Angeles, California. His insatiable quest for an expanded knowledge base in the integrated traditional and alternative medicine drove him to become a Diplomat of the Holistic Board of Medicine (A.B.H.M.). Dr. Keramati is Clinical professor of medicine and dentistry and he still teaches students and residents. Dr. Keramati is different from most dual practitioners in the sense that he has devoted his life to treating underlying medical problems — not just the symptoms. Yet even with his busy professional life, one of his greatest priorities is maintaining relationships with friends and Family. Some of his hobbies include flying private planes, playing soccer, and music. In all the years of Dr. Keramati’s involvement in the healthcare system, his focus has been on preventative measures prior to a patient becoming sick. Never the less, he takes on cases that most practitioners have given up on. Dr. Keramati believes in improving the quality of lives for healthy and sick persons through the biochemical balance of the body. He develops individualized treatments depending on the patients and the diseases they are suffering. Some of these customized and individualized treatments include intravenous infusions, proper supplementation and vitamins, prolotherapy for chronic pain control from sports injuries or arthritis and properly restoring the oral cavity (in addition to all kinds of oral surgeries). Dr. Keramati has also developed variety of skin care creams which also have been helping his patients look younger and feel better about themselves. He has treated numerous patients with these modalities very successfully as his patients have attested to happily. Additionally, his professional focus as a peer in the dental and medical world is to educate, teach and be a resource to his colleagues, something he takes very seriously. Dr. Keramati believes that any patient should be treated based on a full understanding of the patient as a whole. Therefore, treating patients in a 360 degree integrated fashion. In his clinic, the patient and the doctor exchange ideas through one-on-one interactions, as open communication is paramount to Dr. Keramati. He has also been an advocate for the relationship of oral cavity health with the rest of the body for over 25 years. Many recent studies have shown the close correlation between the oral cavity and the patients overall health. 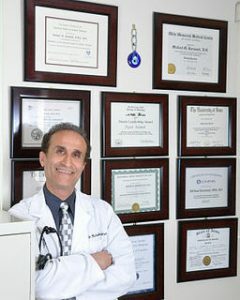 Dr. Keramati’s background as a dental surgeon and a physician makes him a unique authority in this area.